LIBRE Initiative disguises itself as a non-partisan, free-market, grassroots organization, working to advance the well-being of Latinos in the United States. But LIBRE has proven time after time that their only goal is to advance the Koch brothers’ agenda at the expense of the community they supposedly serve, Latinos. LIBRE Initiative is vocally opposing the deferred action programs for Dreamers and parents of U.S.-born children, known as DACA and DAPA. They are campaigning against any debt restructuring relief to Puerto Rico to protect billionaires and vulture hedge fund bondholders. They oppose the Affordable Care Act under which nearly 5 million Latinos now have health care. They oppose an increase in the minimum wage that could help millions of low-wage Latinos out of poverty. LIBRE is engaged in door-to-door activities in key battleground states. Although not registering new voters, LIBRE is collecting personal individual information as data for their database. 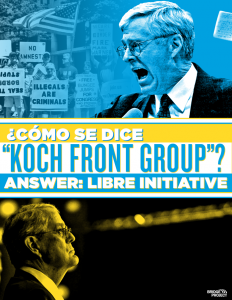 “With groups like LIBRE, the Kochs are gathering valuable information about potential Latino voters that they can sell and share with their Republican-endorsed candidates,” said Vale.